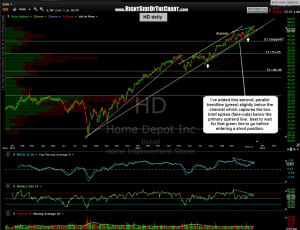 I’m still waiting for an entry on the HD short setup and wanted to update the chart, as I believe this trade will have a high probability of playing out soon. Note that I have added a sub-trendline (green line) to just below the ascending channel. That sub-trendline captured the two prior brief spikes below the primary uptrend line and I think it would be prudent to wait until that sub-uptrend line is taken out before establishing a short position. I’ve also added a horizontal support level which may or may not produce a reaction if/when prices break down below the channel. 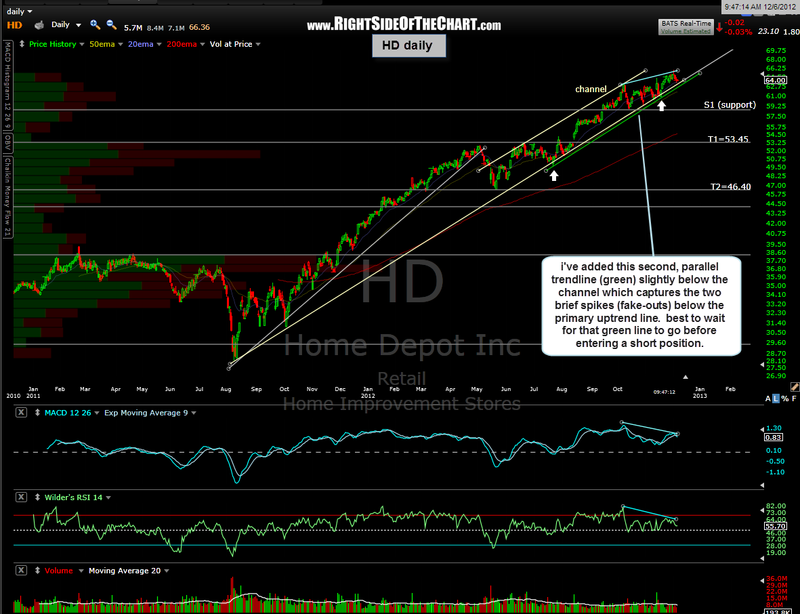 Also note that HD (Home Depot) is a component of the previously posted XHB Homebuilders ETF. In fact, that ETF (the closest proxy to a pure-play on the builders that I am aware of) is comprised of many companies that are not homebuilders but do profit directly or indirectly from the housing sector such as SHW, Sherwin Williams (paint) & ETH, Ethan Allen Interiors (furniture).